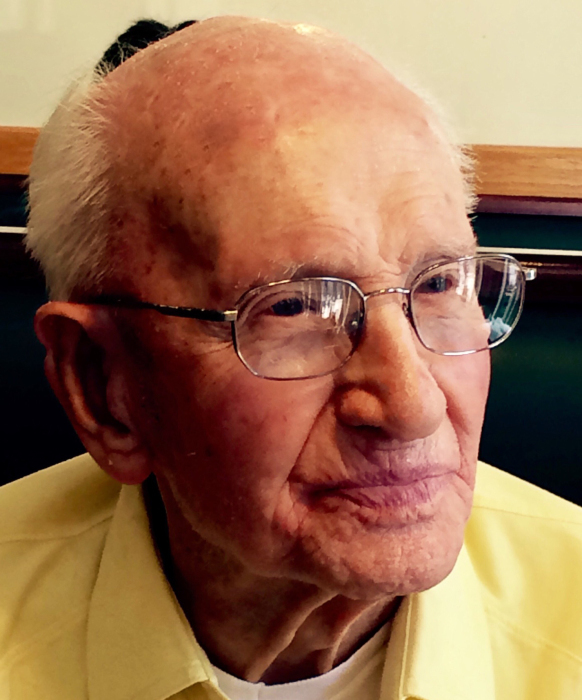 Obituary for Jack E Horoho | McKee Mortuary Inc.
Jack E. Horoho, 99, North Manchester, IN passed away at 9:20 a.m. Monday, December 3, 2018 at Peabody Healthcare Center, North Manchester, IN. Born in Sycamore, Indiana on March 20, 1919, he was the son of Owen and Anna (Crousore) Horoho. After serving in the US Army during World War II and earning two bronze stars, he returned to Anderson and continued his career with Kroger Co. as a manager. He married Pauline Randolph (nee Tucker) in 1946 and they raised their blended family there. Retiring from Kroger they moved to Long Lake in 1967. He worked at Ford Meter Box retiring after 14 years. Jack was an avid gardener, lovingly filling his property with hundreds of varieties of flowers while also tending a large vegetable garden. His biggest passion, however was wood-working and turning. He made anything out of any kind of wood from vines to exotic hardwoods. His beautiful pins were sold at many events around the state. Preceding him in death were his wife Pauline and son Robert, four sisters and a brother. Surviving are children Robert Randolph (Candi) of Marinette, Wisconsin, Bill Horoho (Pat) of Roanoke, Indiana, Candace Bertram (Bill) of Rogers, Minnesota, Dennis Horoho (Vicki) of Rochester, Indiana and special friend Wilma Parmerlee of North Manchester. Family and friends may call Thursday, December 6, 2018 from 1:00 p.m. to 2:00 p.m. at Peabody Chapel, 400 West 7th Street, North Manchester, Indiana. Services will begin at 2:00 p.m., Pastor David Crowley will officiate. Burial will be at Laketon Cemetery, County Road 200 West and 950 North, Laketon, Indiana. The Horoho family has entrusted McKee Mortuary, North Manchester with the final arrangements. For those who wish to honor the memory of Jack E. Horoho, memorial contributions may be made to the Laketon American Legion Post #402, 10140 North Troyer Road, Laketon, Indiana 46943 , or Riley Children’s Foundation, 30 South Meridian Street, Suite 200, Indianapolis, Indiana 46204.